Game 6: What do the Hurricanes know about pressure? Tonight’s game 6 at Carolina marks the second straight elimination game for the Bruins and the second game in a row that the Hurricanes have a chance to send the Bruins on an extended summer vacation. It is amazing how the build up and anticipation for a game can change so much in just 2 days. Sunday morning before game 5 I felt like I was standing on the corner of a street watching a car crash about to happen. I didn’t want to see anything bad happen but you hear the screeching tires and you have to look… Fortunately the Bruins were able to avoid a head on collision with the Hurricanes and have put a little extra gas in the tank heading into game 6. The anticipation for this game has grown exponentially after the Bruins handed the Hurricanes a convincing 4-0 defeat at the Garden that was highlighted by crushing hits from Milan Lucic, great saves by Tim Thomas, quality fighting by Mark Stuart, a couple of jingles from Philip Kessel and a slightly controversial punch to the face of Old Man Ward. Original picks can be found here. 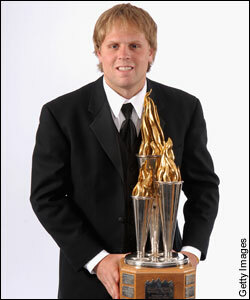 Backstrom, Mason, and Thomas are nominees for the Vezina. Dion Phaneuf is questionable for tonight’s game in Calgary. Anaheim is looking to put San Jose into the offseason tonight as well. There will be 2 game 7’s in the Eastern Conference tomorrow. Devs/Canes and Rangers/Caps. Of course, the next round matchups will not be announced until these games have been completed. Currently Boston and Pittsburgh are waiting for their next round oppenents, along with Detroit and Vancouver. Alex Ovechkin has some words of wisdom for New York’s backstop King Henrik. Pittsburgh tossed Philadelphia to the curb on Saturday afternoon, after coming back from a 3-goal defiicit. Supposely Donald Brashear will have a hearing at 1pm EST today to decide his fate after this hit on New York’s Blair Betts. Brashear should be suspended for Game 7 if the NHL wants to stay consistant with its policies. Nothing says playoff hockey like blocking shots. The Fifth Feather has a great breakdown of doing just that. Second City Hockey has 2 great videos. The first is Matt Walker breaking his finger and only missing a few shifts. The second is Chicago tough guy, Ben Eager, serving up some dinner to Calgary’s Adam Perry. I think knuckle sandwiches were on the menu. Second City Hockey also has a disgusting Blackhawks highlight video for all you Hawk fans out there. 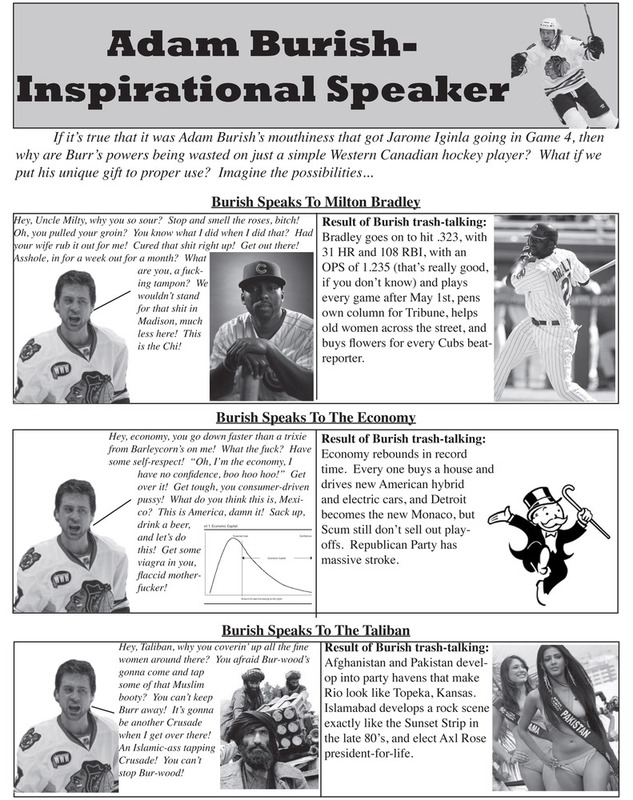 Also, Adam Burish, known around the league for his mouf, tries his hand at motivational speaking. I am off to the Gahden…see you there! A couple of notes going into tonight Game 2 of the Stanley Cup Playoffs. First, we will have a live Game 2 chat starting at 5:30 for the game. I would like to see a lot of people get involved, but please keep it clean and civil. The Boston Bruins took game 1, 4-2 with a lot of extra curricular activities at the end. All of them unwarranted as the Habs tried to send a message for tonight. Shane Hnidy will replace Matt Hunwick tonight; Hunwick out with a reported spleen injury. Higgins decided to run his mouth after Thursday night’s loss. A few last minute game notes. All Bruin’s lines will remain intact, minus Hunwick, who will be replaced by Hnidy. Here is the inside scoop of what happened when Kovalev had his stick swiped by a Boston fan. Ladies, please keep your handbags in site while Ryan O’Byrne and Tom Kostopoulos are not on the ice. Apparently these two have a knack for women’s hand bags. Fellas, I’m sure you look great with a Louis Vitton, but can’t you purchase one of your own? Ironically, the male Canadien’s fan crowd may be facing the same issue. If you see see Andrei or Sergei Kostitsyn and Roman Hamrlik with a little pep in their step and a bank roll, you’ll know it’s not because they’re on the verge of eliminating the Bruins. Something tells me they are in Boston on a different type of business opportunity. As for the Four Habs Fans site, I don’t really know what their story is, for some reason I have not read any of the articles. I can’t get past the headlines. If you’re at Saint or Mansion this weekend and you see a bunch of v-neck shirt wearing nancies, buy them a drink for me, something tells me it will help out the Bruins on Saturday. Apparently the C’s have a drinking team with a hockey problem. Which Alex Kovalev is going to show up for this series? This one or this one? The Canadiens are taking applications for the coaching position for the ’09-’10 season. Inquiries and interviews begin April 23. Requirments: Want to go to a Stanley Cup contendor 5 months after being hired, able to withstand constant ridicule, can handle squirt-level maturity, terrible suit/tie collection. I encourage Canadien fans to take note on how you celebrate beating a #8 seed in the first round. While I don’t predict this will go 7 games (more like 5). The B’s won’t burn down the city after an eight seed takes a one seed to the brink of elimination in the first round! Stay classy, Montreal. Oh, although I think the Original 6 teams have the best logos, yours looks like a toilet seat. I’m not sure if that’s inentional or not. Our ice girls are better.